Welcome to Longo Mai, Costa Rica! On this website we would like to tell you about our community. The Longo Mai movement has its origins in Austria, Germany, Switzerland and France. Young people from the "generation 68" founded the first settlement in 1973 in France ("Longo maï" in Provençal means “may it last long”). They focused on living together, based on self-administration and agricultural self-sufficiency. In addition, they initiated many social projects. In 1979, when many Nicaraguans had to flee from the terror regime of Anastasio Somoza, the cooperative decided to buy land in Costa Rica. The idea was to make it available to the refugees and thereby enable them to live independently and in dignity. After the victory of the Sandinistas, most of the Nicaraguans returned to their home countries. 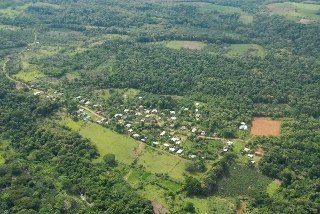 Families of Salvadorian refugees replaced the Nicaraguans, and landless Costa Rican peasant families (indigenous and non-indigenous) settled down as well. Today, most inhabitants have Salvadorian roots. Roland Spendlingwimmer, a founding member of Longo Mai, has been guiding the project from the very first day. While in the 80's the primary concern was to provide shelter for Central American refugees, the community is today developing into an ecological center. Located at the center of vast Del Monte pineapple plantations, the village of Longo Mai (Longo Mai and Finca Sonador are used as synonyms) functions as a “green lung”. Whereas the huge pineapple plantations are a social and ecological catastrophe, the agriculture of Longo Mai is combined with environmental protection and eco-tourism. For its own use, the village produces corn, beans, rice, yuca (manioc), bananas, platanos (plantains), meat, milk, eggs, fruit etc. They also grow coffee and sugarcane crops to sell on the market. Longo Mai today comprises about 2,200 acres, half of which is protected rain forest. For the approx. 400 inhabitants there are two pulperías (village stores), one school, a kindergarten and two churches. Also, one regional environmental organization (UNAPROA) is based in Longo Mai. The infrastructure as well as various activities are run by numerous committees. The project tourism on the Finca Sonador provides a vivid example for an authentic, cross-cultural enconunter. A visitor to this village will surely transform from peripheral spectator into experiencing another way of life from the inside. Guests are completely immersed in the life of the village, participate in everyday life and make an active contribution to the development of the village. Accordingly, a long-term stay of months forms friendships with locals and personal links to host families that continue even after visitors have left. It is particularly pleasing to see that this programme is designed for young people who were raised in the cities of our affluent society. Usually, European youths have never experienced need or felt physically what it means to live under developing world conditions. On the Finca Sonador, most of them find themselves beamed into another world and learn personally that what seemed completely normal and self-evident is actually not self-evident everywhere. This way, the locals of the Finca Sonador are in some way giving meaning to it all. Their way of life is completely different and their life rhythm is shaped by the sun and the coffee crop. The people of the Finca lead a simple life, not because they are materially worse off compared to us Europeans, but because they expect less from life; health, ease and enough food. Everything else is superfluous. Here, the stress and consumption of western countries is a far cry and people don't have to chase happiness. Their capacity to give a meaning to life irrespective of material concerns is a completely new experience and source of new insights for young visitors. Along these lines young visitors frequently develop a new attitude to life and a new way of looking at the world around them. A place of cross-cultural encounter with this kind of potential is quite rare in tourism. A better way of promoting young people's respect and tolerance for other cultures and societies will be hard to find.